Published March 24, 2014 at 622 × 480 in Landscapes and Seascapes. 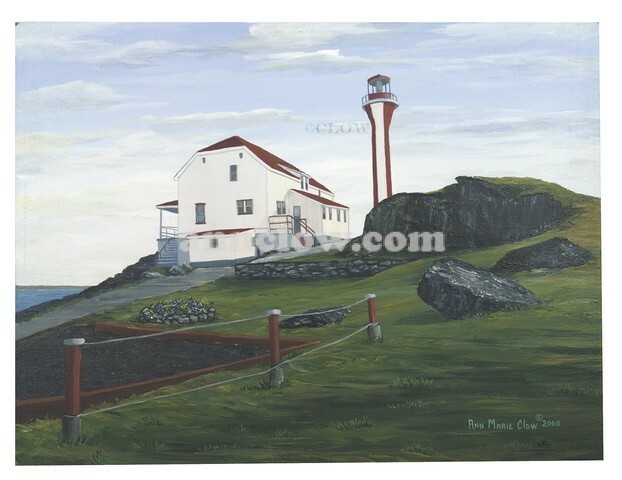 Cape Forchu Lighthouse 12x16 - The light of the original 1839 structure could be seen approximately 20 miles out to sea, but the new concrete structure of 1964, which replaced the old light due to the effects of strong winds and seasoned timbers, extends another 10 miles. Also, having a narrower base than top, the lighthouse's design is very rare in Canada. The lighthouse sits 37.5 meters above sea level, is located among jagged rocks, and offers breath-taking natural beauty. About 10 kilometers from the town of Yarmouth, it is popular for rock climbing, wave watching and other meditative pursuits.